Usain Bolt's management team--aptly entitled "Team Bolt"-- is dismissing statements that the triple world record holder was offered and will take a multimillion dollar contract with Chinese firm Anza Marketing Group (AMG). Chief Executive Officer of AMG, Anja Williams, claimed that the deal offered Bolt approximately $115million over the next 5 years, an unprecedented amount in the track and field world that would also include a unique base salary and licensing deal term. AMG currently maintains the sole rights to marketing Usain Bolt in China, but Team Bolt has claimed the high-profile deal a "presumptuous" statement. After sprinting the straightaway in Berlin and garnering the 100meter world record in 9.58s, and then running the curve for the 200meter world record in 19.19s, Bolt's marketability all over the world has gone into over drive. According to Bolt's agent Ricky Simms, Usain is the highest ever-paid athlete in track and field with his current $5million a year off contracts. His solid world championship performances and world records helped solidify the sprinter's place and face in markets across the globe. 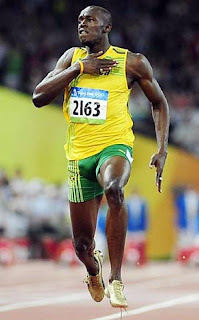 He currently holds contracts with Puma (he receives at least $1.5million from them per year), Gatorade, Texaco and Digicel, but reports say that when his Puma contract ends in 2010 Nike is planning to offer Bolt a $40million deal. Team Bolt is stressing that they respect and would never break the terms of the valid contract the world record holder has with Puma by acting upon the supposed offer by AMG.